After watching the "How to Make Crêpe Batter" tutorial, you'll see how fairly basic it is. As I mentioned in the video, I first learned how to make crêpes in kintergarten back in France, and I haven't forgotten since then. After a little practice, you'll be able to adjust the quantities of liquid (milk, alcohol or citrus juice) by eyeballing until the perfect consistency is reached (see video). 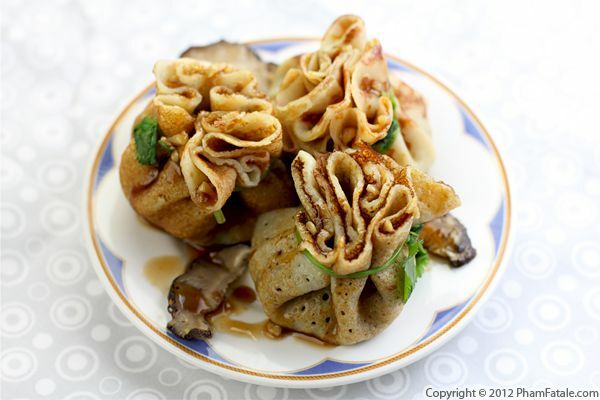 You can fill the crêpes with many possible ingredients. This savory version contained pearl onions that I glazed in Marsala wine, brown sugar, butter and truffle balsamic vinegar. It wouldn't be the same without a bit of cheese, so I started with a thin layer of Gruyère and topped the onions with a sprinkle of French feta. My sister-in-law Lya had a sleepover with her girlfriends here last weekend. They had to wake up very early the following day to participate in The Color Run™ 5k paint race event. I promised I'd give them a large breakfast so they'd have enough energy. I served them sweet potato tarte amandine (check out the photo on Facebook), thumbprint cookies and crepes. I prepared plenty of crêpe batter the night before so I was able to use the rest for lunch and create light, savory crepes. I filled them with a cheesy mascarpone sauce, sautéed kale and broccoli. 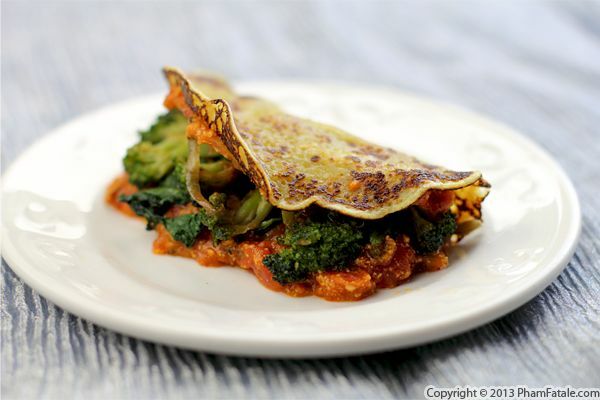 Don't be fooled by the abundance of greens; this healthy, savory crêpe is very flavorful and filling. The, creamy sauce will keep you full until it's time for the next meal. In less than 3 weeks, La Chandeleur is going to be celebrated in France. It originially was a religious event (40 days after Christmas) but nowadays, it's become a more commercial celebration). Crêpes are traditionally served on the holiday, which gives me an excuse to flip some crêpes for my family. I know that making crepes is intimidating for a lot of people, but I have prepared crêpe batter countless times and I promise it's easy to master, and with a little bit of practice you'll have no problem with it. In general, for La Chandeleur you'll see them served as dessert, either with fruit and cream or simply sweetened with a sprinkle of sugar. Savory versions (ham and cheese is a staple), however, are not uncommon. 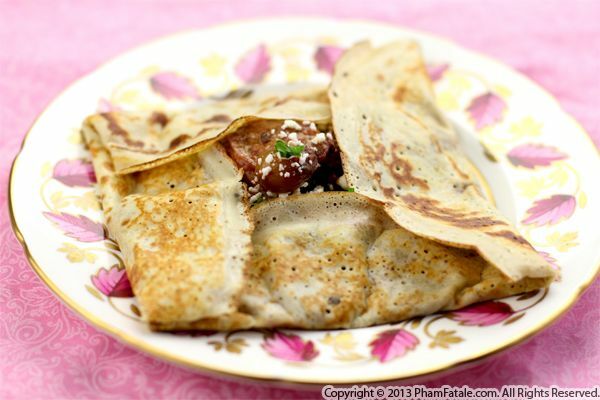 This recipe is for a "forest"-style crepe, which means it's filled with mushrooms and it's also known as beggar's purse. I added a few roasted chestnuts and garbanzo beans for extra protein. I hope you're inspired to make some crepes yourself. You'll be a pro in no time! I'm giving away a copy this week and will announce the winner next Monday, January 14th, 2013. I am so grateful for all the blessings I have in my life. Thank you so much for your love and support. Here’s to making 2013 as unforgettable as 2012! Ficelle picarde, which literally translates to "Picard string" in French, sounds like a fancy dish, but really, it's just a savory crêpe gratin filled with sautéed chopped mushrooms (called duxelles). It's a specialty from the region of Picardy, located in the North of France. The authentic dish is made with ham but I replaced it with soy chorizo to make it vegetarian. 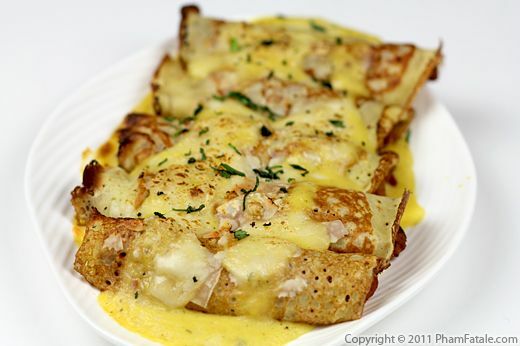 First, mushroom stuffed crêpes are rolled, then placed in a casserole dish, covered with Mornay mushroom cream sauce and sprinkled with Gruyère cheese. The last step is 5 to 10 minutes in the oven until bubbly and golden. Crêpes are a fairly frequent dish at our home. The batter can be prepared in advance and you could also store pre-cooked crêpes in the freezer for faster assembly time. Whether they are served as a savory dish or as a dessert (or both! 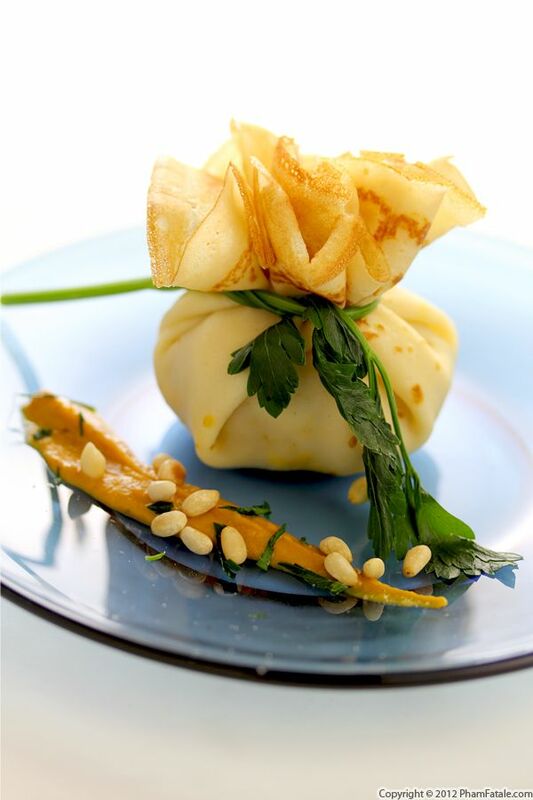 ), we always find a new way to pair them with interesting combinations of flavors.